The College visit to Francis Jordan Catholic Primary School was a highlight for our Concert Band, dancers and AFL Representatives on Thursday last week. The Mater Dei students and staff entertained the primary school students, demonstrating their talents and the opportunities available at Mater Dei. My thanks to Mr Basile, Mrs Martin, Mr Hendricks and students. This week we hosted the Year 4 students from St Luke’s Primary School for a Mater Dei Discovery Day. The students enjoyed time in the Science Laboratories and Art Workshop. Well done to the student leaders and to Mrs Lombardo, Mr Hurd and Mr Longshaw. The Community Fair and Arts Showcase is scheduled for this Saturday from 11am-3pm (prior to the Eagles game!). I encourage families to attend, to enjoy the community stalls and to view the Showcase of students work in the Salvado courtyard. This year the Arts, and Design and Technology Learning Areas have been very creative not just in the classroom, but with the whole learning space into the Salvado courtyard. Many students and staff have contributed to the artwork under the careful guidance of our Visual Art teachers. Mrs Genevie Baker will be present as the guest artist for the Showcase as she is the Arts Consultant at Catholic Education WA. I look forward to seeing families on the day. The Showcase will be followed by Open Afternoon on Monday 10 September 4-5.30pm. Each Learning Area in the College will demonstrate student work and learning opportunities. Next weekend, our students and staff involved in the College Inaugural Space Camp are scheduled to depart for the USA. In addition, the Japanese language students and staff are due to depart for a tour of Japan. These are such exciting opportunities. Please keep them in your prayers. This week all Principals received a letter from the Most Reverend Timothy Costelloe, Archbishop of Perth. 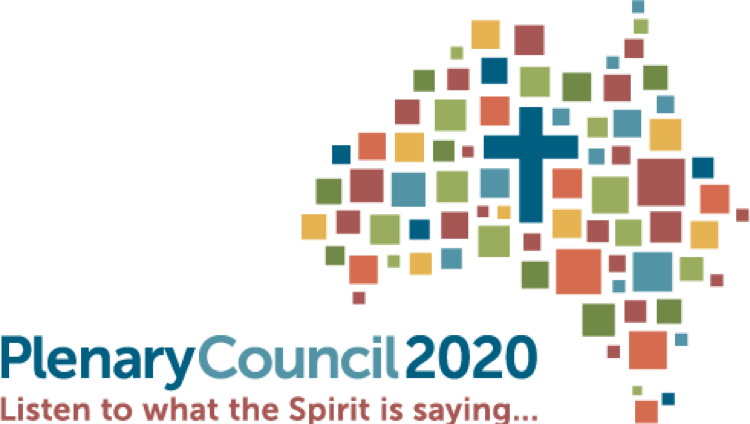 Archbishop Costelloe’s Pastoral Letter is a response to the Royal Commission. As Catholic educators and leaders, our highest priority is to ensure our Catholic schools are safe places where all students can flourish in their learning. I urge families to please read Archbishop’s Pastoral Letter which is included with this newsletter. 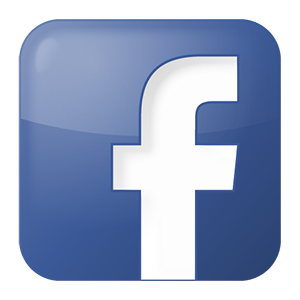 To read Archbishop Costello’s Pastoral Letter, please follow the link HERE. Round Two of the OLNA has now been completed for 2018. Thank you to all staff who assisted the students in preparing for this assessment throughout the year, especially teachers in the English, Mathematics and Learning Support Departments. The School Curriculum and Standards Authority are due to release students’ results on Monday 15 October 2018. Correspondence advising relevant students and families will be sent following this date. 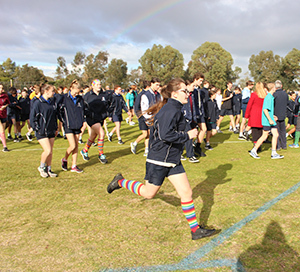 During Wellbeing Week this term all students and staff in the College participated in the Lap-a-thon for LifeLink. This whole school event was the major College fundraiser for LifeLink and students were asked to raise some funds for this worthy cause. We are pleased to announce that the total raised for LifeLink was $4092 and would like to thank all those who contributed so generously. This money will go a long way in supporting the needy individuals and families who access the following Catholic agencies. Bishop Don Sproxton will be our special guest at our whole school assembly on the last day of term and will accept our donation on behalf of LifeLink. 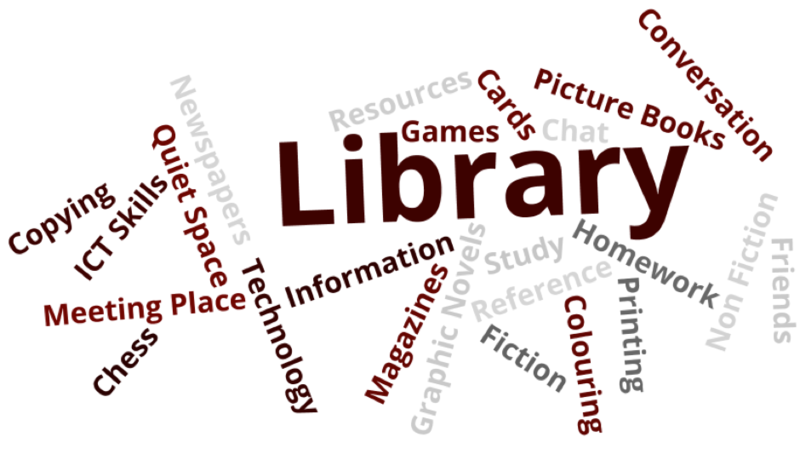 Study skills tip for September – best way to study? Students sometimes ask ‘what is the best way to study?’. The answer is, there is no best way. An important lesson for students to learn is that everyone learns in different ways, everyone has different approaches and preferences, and what works well for one person may not work well for another. This truth applies to all aspects of effective learning – time management, research skills, writing skills and so on. There are certainly good techniques and strategies available in all of these areas, and also approaches that work well for the majority of students. However, it is essential that all students try different techniques to see what works best for them. Preferences could also change over time, so it makes sense to at least once a year stop and reflect on approaches to learning. What did you do, what worked, what didn’t, what should you change, what should you keep, and what new things could you try. This is what ‘metacognition’ is all about. It means taking the time to try and understand more about the process of learning and your role as a learner. Students who take a metacognitive approach to their learning are much more likely to improve their results. How can you find out different study techniques to try? Talk to the people around you – friends, siblings, parents – ask them what techniques they have used. Also ask your teachers what they would recommend for their subject. You can also visit the unit on the Study Skills Handbook that covers how to study for tests and exams. You will find lots of active studying strategies and grids to help you plan for exams. Just remember – there is a worst way to study – just reading your notes over and over and hoping the information stays in your head! 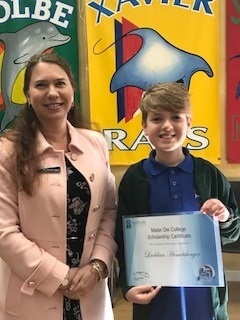 We are happy to announce that Lachlan Hemetsberger from Francis Jordan Catholic Primary School is the recipient of the Year 7 - 9 2019 Academic Tuition Scholarship. It is a very competitive process we are certain that his family is very proud, we look forward to Lachlan joining our school community. Locomotion and in comparing quadrupedal ground runners, with quadrupedal branch runners, and then comparing slow climbers, such as orang-utans with the best brachiators in the primate order, the gibbons. Students had the opportunity to consolidate their knowledge and understandings in preparation for an upcoming assessment on why humans are classified as primates and the features, that make us unique. On Thursday 30 August, students and staff from Mater Dei College participated in Rebound WA’s Wheel Chair Challenge. For the entire day we moved around school only via wheelchairs. 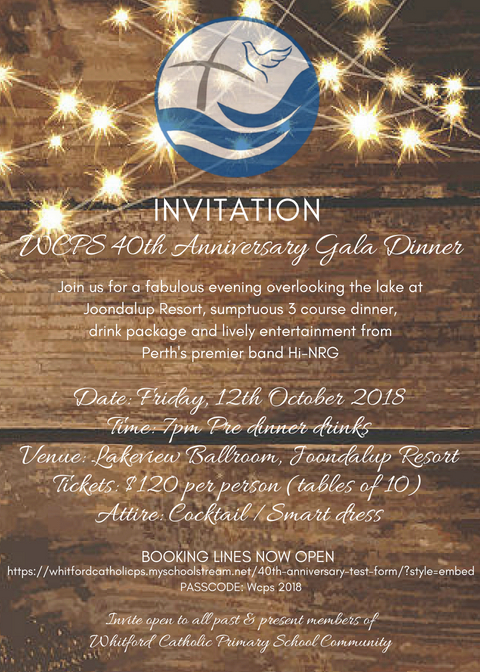 Not only did we have a first-hand experience on what it is like for school students who are confined to a wheelchair, but we also raised much needed funds for Rebound WA. 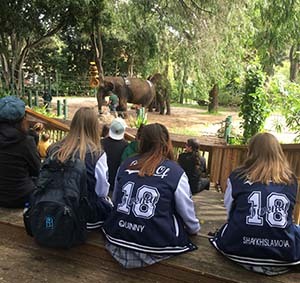 This experience was a big eye opener for myself, and I am sure for the others also, as being a Year 12 student I have gone through high school with very little trouble making my way around the school. By the end of the day I had blisters on both hands and my arms were very tired. Being in the wheelchair added around ten minutes onto the time it took me to get to my classes, making me late to most of them. It made me more appreciative that I could get around so easily compared to those who are in wheelchairs and even those with other physical disabilities. An amazing total of $1,344.56 has been raised so far which will go towards providing social, recreational and sporting opportunities for children and adults with physical disabilities. A big thank you to Mrs Fullam and Ms Scott for organising the event and to all those who sponsored our team. The fund-raising link is open till the end of Term 3. 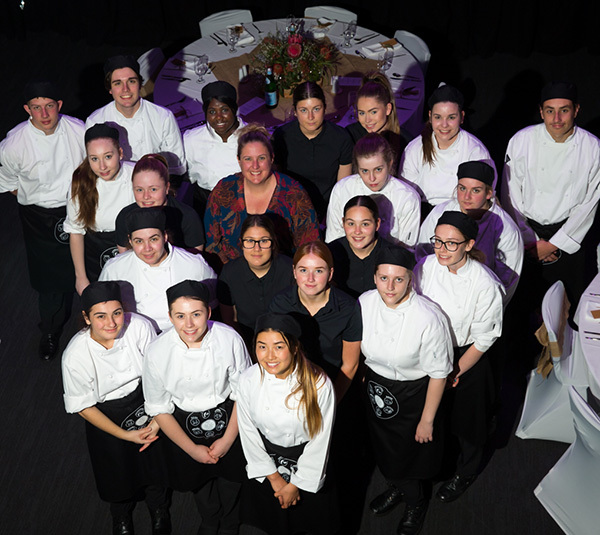 On Wednesday 29 August our Hospitality students hosted the annual Community Dinner for the College Board, Executive and past staff members. Students prepared and served the food as an assessment component of their Hospitality Certificate. The food and decoration were indigenous inspired and looked beautiful. Congratulations to the students and staff involved. 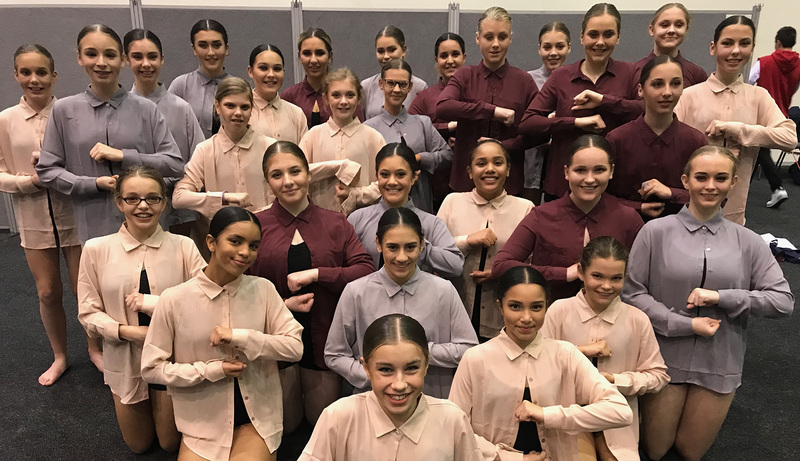 On 22 August, Dei to Dance performed at the Catholic Performing Arts festival at The Perth Convention Centre. The dancers worked all year choreographing two routines for the performance. 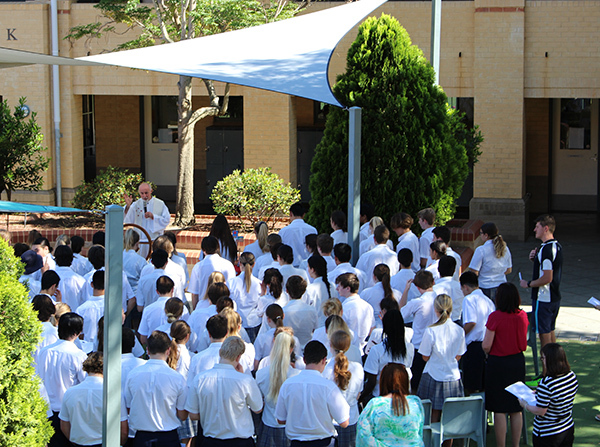 The Year 11/12 Certificate class collaborated on a piece called, Rise Against Hunger. The piece was inspired from a quote by Mother Teresa, “If you can’t feed a hundred people, just feed one.” The dance was a contemporary work that captured the essence of the message and compelled the audience to relate to this very touching subject. The second piece was choreographed by two Year 10 students, Tahnee Lane and Laura Doleman. They chose to choreograph a piece related to the latest mass shooting incident in the U.S. The piece was aptly titled, The Last Mass Shooting and was very well received by both judges and audience members alike. If you would like to see the students one last time, they are performing in an informal setting at the Open Day afternoon on Monday 10 September in the Bernie Boss Hall, from 3.30 to 4.30pm. The following students are to be congratulated for outstanding results in the very challenging Australian Science Innovations (ASI)– Big Science Competition they sat earlier in the year. It is a 50 minute, multiple choice competition testing critical thinking and problem solving skills. Questions are set in real-life, contemporary contexts, making them relatable and interesting which are aligned with the Australian Curriculum – Science. In Week 6 the Library celebrated Children’s Book Week with the theme of ‘Find Your Treasure’. 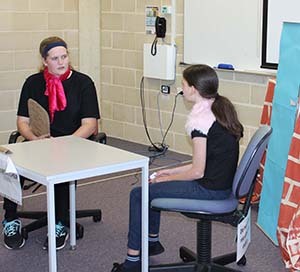 Numerous activities were offered to the College to promote an interest in books and reading, culminating with Dress Up Day on Friday 24 August with gold coin donations going to the St Vinnies Winter Appeal. Treasure Hunt Senior Winners: John-Paul Acres and Brody Williams. Junior Winner: Philipp von Guttenberg. Seniors: Winner Amy Cunningham and Runner Up Bailey Tucker. Thank you everyone for your enthusiasm and participation! On Thursday 30 August, approximately 24 senior students travelled to George Burnett Park, Karawara, to participate in a one-day secondary schools’ Touch Rugby tournament. Our girls team played five pool games against strong opposition and finished the day with a quarter final clash against Mandurah Catholic College which they won by a narrow margin. In their ‘knock out’ semi-final against Aranmore Catholic College the following Monday, the girls tried hard but were convincingly defeated. Along the way to their top four finish overall, the girls had strong wins over Mercy College, Melville Senior High and Quinns Baptist College. The squad was made up of Year 10 and Year 11 students who displayed great effort and skill throughout the tournament. Stand out performers included Violana Winchester, Aiysha Wigley, Maddy Lloyd and Jenna Jordan. Our boys played seven pool games, winning four matches and drawing one. In their other two games, they lost narrowly to Atwell High and Willetton High. Despite finishing equal second in their ‘pool’, they did not qualify for the finals on percentage. Stand out performers included Zac Atkinson, Tarik Arbuckle, Jesse Lloyd, Christopher Evans and Harry Steer-Wright. A big thank you must go out to Mr Gray and Lachlan Atkinson (past student of the College) for their coaching and support leading up to and on the day of the tournament. Congratulations to all who participated and represented the College with great distinction. We look forward now to participating in the 2019 SSWA Champion Schools Touch Rugby Tournament at the same venue where our senior girls have an opportunity to reach the grand final ‘winner take all’ match. 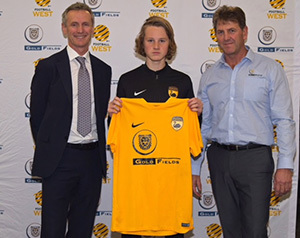 Jude Gauntlett recently returned after representing WA at the under 15’s Jinshan Shanghai International Soccer Tournament, competing against the Chinese and Indian national youth teams and Slavia Prague Football Club. Congratulations. Rhiannon Clarke was Nominated for the 2018 Pierre de Coubertin Award. 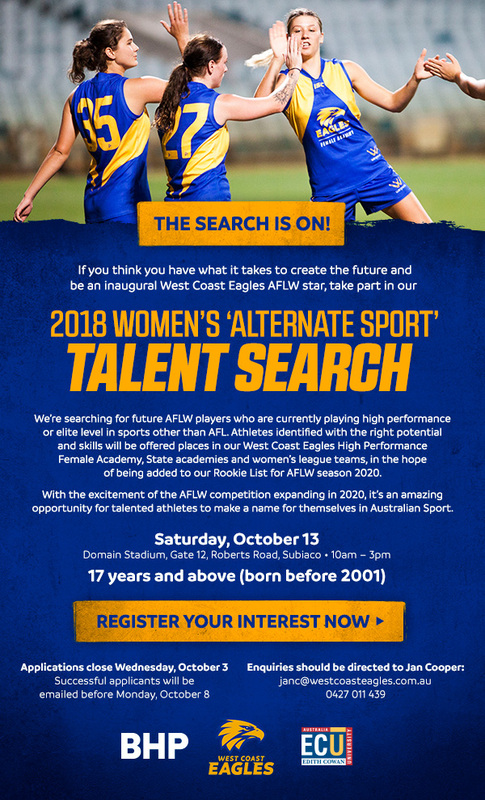 The Olympic Academy Day and official State Presentation was held on Saturday 1 September 2018 at the West Australian Institute of Sport. This day was held in conjunction with the WA Official State Presentation for recipients of this year’s Pierre de Coubertin Award, providing them with opportunity to meet Olympians, attend Leadership Workshops and learn about the International Olympic Movement. Rhiannon feels so honoured to be nominated by Mater Dei. The Awards are held annually in each state (except NT) and are presented to one Year 10, 11 or 12 student, from participating High Schools. 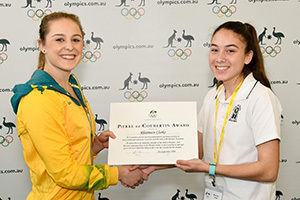 In WA in 2018, The Australian Olympic Committee awarded 43 students from among the approximate 16,000 students attending those participating High Schools. Of the 43 students, 33 students and their families attended the State Presentation Ceremony held in Perth. The students were invited to an Olympic Academy Day held prior to the Presentation Ceremony, which provided students with a once in a lifetime opportunity to learn about leadership, goal setting and resilience from some of WA’s Olympic heroes. Olympians Jesse Phillips (Sprint Kayak); Tamsin Cook (Swimming); Danielle Kettlewell (Synchronised Swimming) and Rhys Grant (Rowing) shared with the students their own Olympic journey. The students also learnt about the Olympic movement and toured the Western Australian Institute of Sports high performance facility. Emcee, Olympian Jesse Phillips who has attended multiple Pierre de Coubertin days, said he is grateful for the opportunity to meet students and foster their spirit for personal excellence. “The students receive an insight into the whole Olympic Movement. The journey is much bigger than just what you see at the Olympic games every 4 years. It is an ongoing journey with many obstacles, setbacks, hopes and dreams to represent our Country”. 1. Discover your Why - What do you want to achieve? 3. Change the language - create positive dialogue, set small challenges on the journey to achieve your ultimate goal. “It was fantastic to speak to the students and their families today, I love sharing my story and the process of how I achieved my goals to hopefully inspire them to achieve their own”. 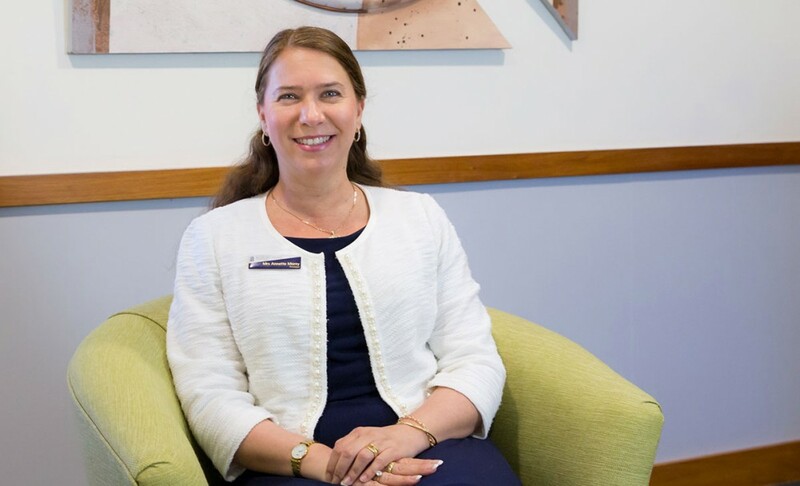 Australian Olympic Committee WA State Manager Lisa Lilleyman acknowledged the great support from schools throughout Western Australia for the Pierre de Coubertin Award, with nominations received from metropolitan and regional schools including Albany, Geraldton and Christmas Island. 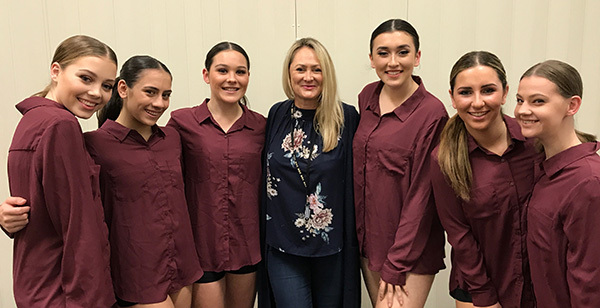 “We are thrilled so many wonderful WA Youth could be recognised for displaying the Olympic Values and their commitment to excellence in all areas of their lives. We are pleased so many could join us for the Academy Day and continue to be inspired by our Olympians”. 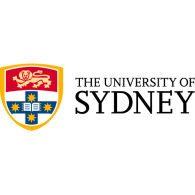 Every two years, The International Science School gathers 140 top young science students from Years 11 and 12, from around Australia and across the world to participate in an amazing, all expenses paid (approximately $3,500) two-week residential program of science at the University of Sydney. The program includes inspiring talks by world-leading researchers, tours of scientific labs, hands-on experiments and activities, and a packed social program and runs from 7 July – 20 July 2019. At Notre Dame, we know you're a person, not a number. That's why our admissions process goes beyond a single score. Entry to Notre Dame is based not only on your academic record and potential. We also consider your personal qualities, motivation to study and contribution to your community. 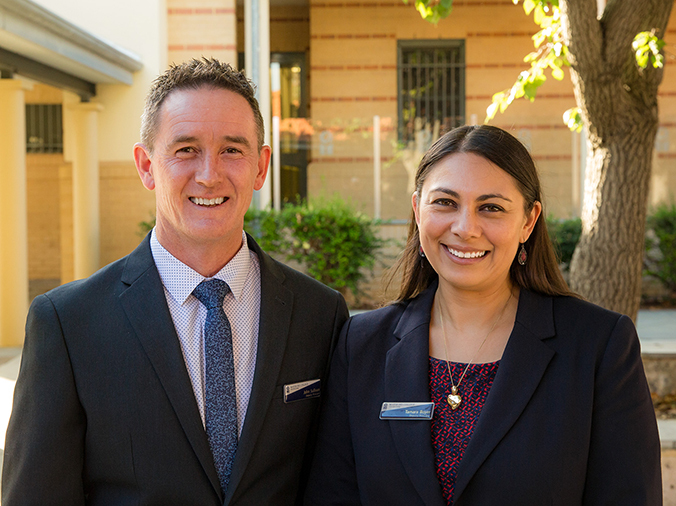 Find out all you need to know about how to apply direct to Notre Dame at our Admissions Info Evening. 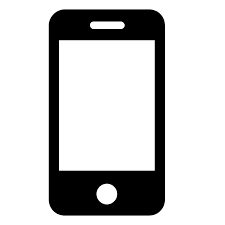 We can provide you with feedback on your application and personal statement if you bring it with you also. You can even apply on the night! Have your questions answered about our degrees and alternative pathways at our Program Expo. Applications for Semester 1, 2019 are due Friday 28 September. 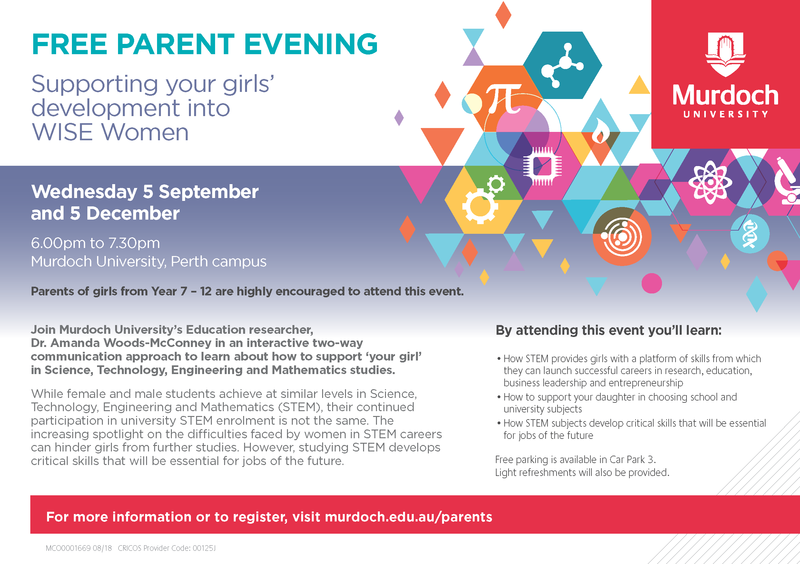 This evening will give you the information you need to understand the diverse, exciting and secure career paths available to girls who study STEM. 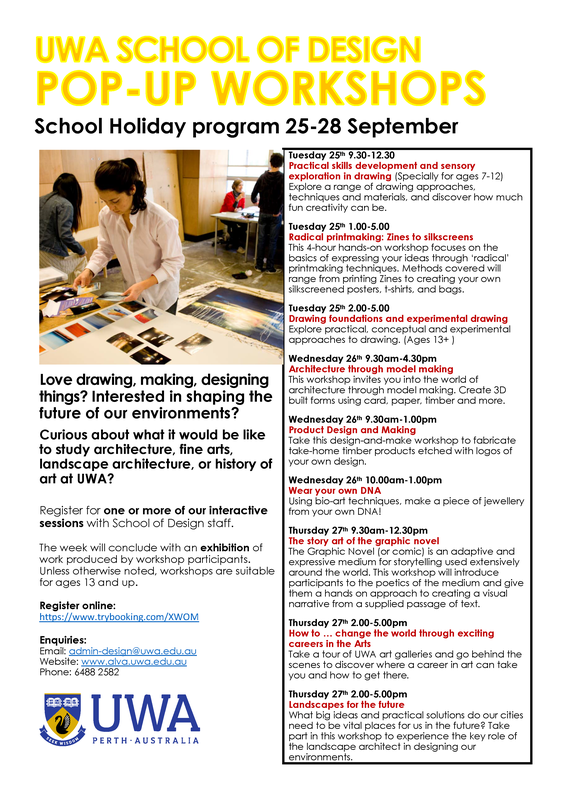 During the September school holidays, the UWA School of Design is offering a series of short workshops on our campus, intended to appeal to school students who have interests in the fields of art, design, architecture, landscape architecture, and history of art. The workshops will all be conducted by School of Design staff and will be hands-on interactive experiences, suitable for students aged 13 and over. Want to learn a trade? Or maybe you’re already qualified? Either way, the Australian Defence Force provides great career opportunities for trades. Is on this Saturday 11am - 3pm. Come along to view for a fun day for all the familly. 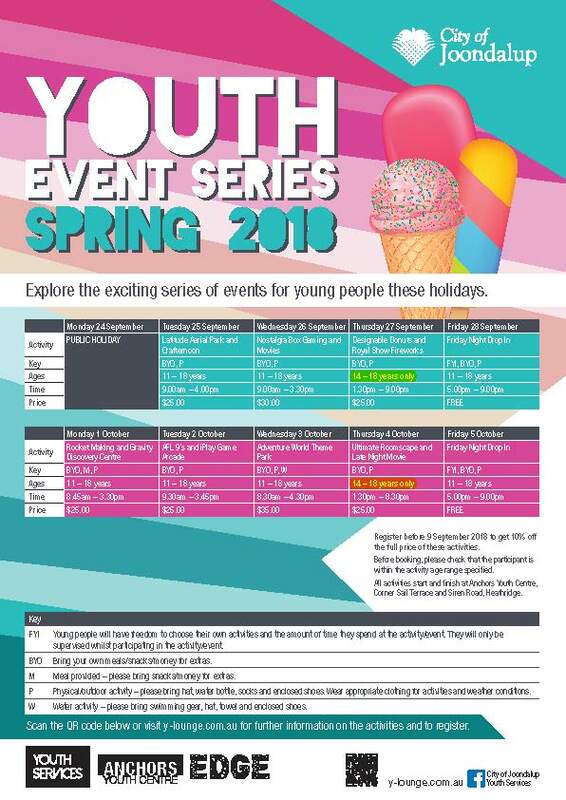 The Youth Services Team at the City of Joondalup will be hosting another awesome holiday program this Spring. 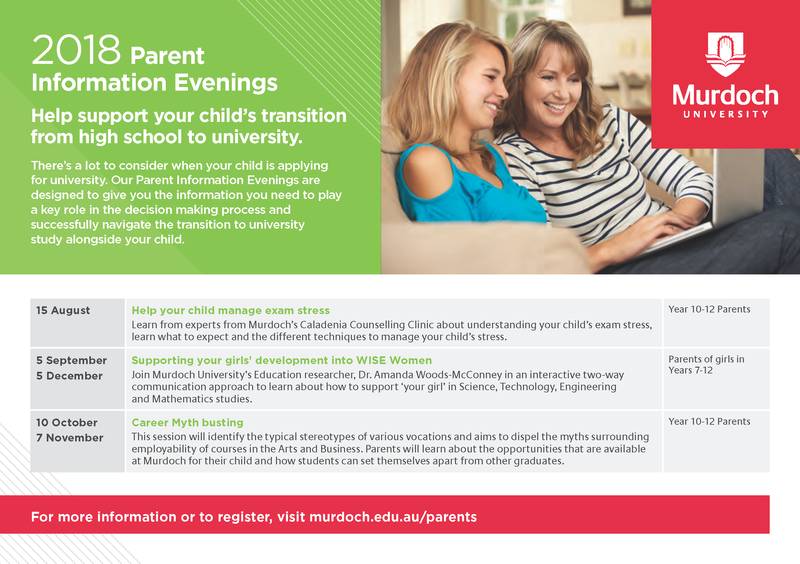 Check out the program by clicking on the picture below and then follow the process at y-lounge.com.au/anchors to book your spots now! Please note: Early bird registrations are now open and if you book before Sunday 9 September, you'll get 10% off the full price of these activities.